The TM Series Digital Water Meter is a high output PVC digital flow meter that offers durable, compact, high precision fluid measurement at a fraction of the price you’d expect to pay for comparable systems with similar features and benefits. These water flow meters have a large 1/2″ digital display with a battery life of 5000 hours and are easy to field calibrate. The digital display shows rate plus two flow totals; one total is resettable and the other locked and cumulative. The battery powered electronic displays are calibrated to read in gallons or liters per minute. These meters come in line sizes of 1/2″ to 4″ with NPT, spigot and 150 lb. ANSI flange fittings. 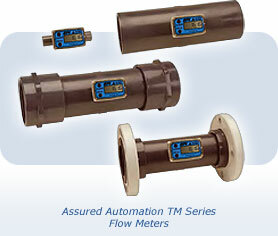 Assured Automation’s TM Series plastic flow meter have been used successfully in many industrial applications, including any that would include high volume water mixing such as commercial mixing tanks, geothermal heating and cooling towers, agricultural sprayers, cement mixers and aerial crop sprayers. An engineering firm was being charged sewage fees based on the water meter the local water authority had on the water line going into their development. The building manager noticed the sewage fees had increased dramatically over the past several years. He realized that a significant portion of the water was not going down the sewer, but was being used for the irrigation of the extensive landscaping and fountains at their facility. The building manager spoke with the local water authority about options. The local water authority agreed to deduct the amount of water used for irrigation from their sewage bill if the building manager could accurately meter the irrigation line. Assured Automation showed the building manager the TM Series Meter. The TM meter is a low cost, battery operated turbine meter with +/- 3% accuracy. The field replaceable batteries offer a long working life: 5000 hours. The integral digital display shows flow rate and 2 cumulative totals (1 total is resettable). The TM Series was ideal for this application. They immediately installed the TM meter on their irrigation water line. It gave a cumulative total the water authority could read and deduct from their sewage bill. They saw a significant drop in their sewer cost the following month. The meter also provided a trouble shooting benefit. A few months after the meter was installed the building manager noticed that flow was still registering on the meter, even after the sprinkler system shut down. After an extensive search, they found a break in their irrigation line that was leaking a significant amount of water. It may have gone undetected for months if they did not have the TM meter in line. This entry was posted in Flow Meters, Latest News, New Product Announcements and tagged Digital Flow Meters, Digital Water Meters, Irrigation Meters, PVC Water Meters, TM Series digital water meter. Bookmark the permalink.